One must have a DENCH shirt to be truly #DEEEEENCH. #NOTDEEEEENCH. Any questions? Photo: Guardian. Well, the treble is still on! Conceding an 83rd minute goal to lose a match 1-0 is going to be a tough pill to swallow, regardless of the circumstances; when it knocks you out of a competition, it's even tougher. But, the Arsenal youngsters should have their heads held high after the way they played against Manchester City's expensively assembled back-up squad. They defended exceedingly well, almost certainly beyond expectations, and have a tremendous amount to be proud of. The plus side of being knocked out of the Carling Cup at this stage is that it allows you to concentrate your efforts on more important matters, like the league, for a while. Arsenal don't need points from their last Champions League group stage match, so those games won't matter again until February. The FA Cup's third round starts next month. From now until January 7, the only thing that truly matters is the league. Arsenal will play a string of seven league matches over those six or so weeks. There's only one midweek league game (Villa away on the 21st) and that's followed by the Boxing Day fixture, which is on a Monday. There's no reason why the team's regulars wouldn't be well rested for close to all of these games. That's a very encouraging thought, in a period of time where many of the team's starters are in a "red zone," in danger of injury due to muscle fatigue. Now it's time to concentrate on climbing higher in the table, up from the seventh position which Arsenal currently occupies. That starts with Wigan away this weekend, a fixture which has seen depleted and/or rotated Arsenal squads drop points from winning positions in consecutive seasons. But, this team is not depleted, nor should the squad be rotated. The stars are aligning now for Arsenal (or some other metaphorical gibberish.) It's time to take advantage of the less congested fixtures list. 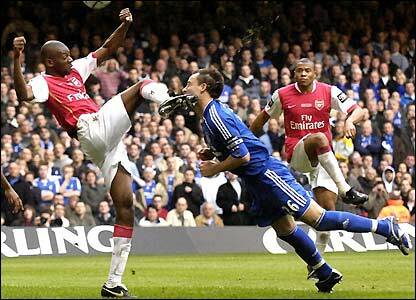 kicking John Terry in the face a bit, shall we? Thanks to the squad rotation which took place on Tuesday in the Carling Cup, Arsenal should have a relatively well rested side tomorrow, something they could not say last Saturday after a hard fought mid-week clash against Dortmund. Arsenal made ten changes to the side between the Fulham draw and the Carling Cup and I'll expect they'll make ten more tomorrow. Arsenal's long-term injuries are well known by now, and all four will be out for the next few weeks, some longer. Kieran Gibbs is recovering from hernia surgery, Bacary Sagna from a broken leg, Carl Jenkinson from a stress fracture in his back, and Jack Wilshere from ankle surgery. In terms of the recent and short-term injuries, Abou Diaby is hurt again with a hamstring strain which could cause him to miss out again. In addition, Tomas Rosicky remains out with a thigh problem he picked up in training. The Arsenal front and midfield almost picks itself these days, though it would be nice if someone on the left, whether it be Andrei Arshavin or Gervinho, would find some form soon. Robin van Persie starts up top, Theo Walcott is on the right, and the midfield trio is Alex Song, Aaron Ramsey, and Mikel Arteta. And, of course, the goalkeeper, Wojciech Szczesny, picks himself, too. I wouldn't put it past him to write his own name on the team sheet before Arsene Wenger gets to it in the morning. So, that leaves the back four. Johan Djourou has started the last two, so I think it's his turn to get a break. That'll push Laurent Koscielny back to the right, with Thomas Vermaelen and Per Mertesacker in the middle, and Andre Santos on the left. Predicted XI: Szczesny, Koscielny, Vermaelen, Mertesacker, Santos, Song, Ramsey, Arteta, Gervinho, Walcott, van Persie. unwanted shower. Alcaraz complete his ban in this match. Wigan's only injury concern is goalkeeper Chris Kirkland, who has been experiencing back spasms. Having purchased Ali Al-Habsi from Bolton (whom Wigan had on loan last season,) Kirkland was not the starter anyway. Kirkland went to Doncaster Rovers on loan in October, but was returned to Wigan after a recurrence of the injury after a week. 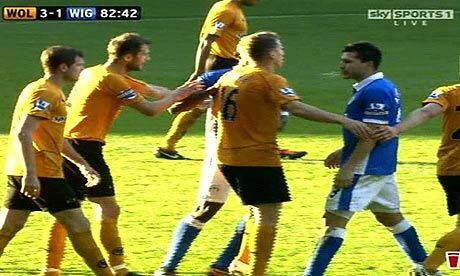 Antolin Alcaraz will serve the third match of a three match ban he was handed retroactively for spitting at Wolves defender Richard Stearman during Wigan's 3-1 loss at Molineux on November 6. Well, despite a performance every Gooner should be proud of, Arsenal had their 10 match unbeaten streak snapped by Manchester City in the Carling Cup on Wednesday. A shame yes. Bright spot? That 10 match run saw a turn in Arsenal's dreadful road form. Since the loss at White Hart Lane, Arsenal's travels have produced three wins in three matches. They won at Marseille in Europe, they won at Stamford Bridge when some guy fell down, and they won at Norwich. The latter two of those matches saw Arsenal come from behind to win. Arsenal's draw last weekend followed by the midweek loss means this is the first time Arsenal have gone two straight matches without a win since mid-September, when they drew Dortmund before losing to Blackburn. job at Sunderland. Photo: Guardian. Wigan, on the other hand, has experienced an almost absurd start to their season. Through the generosity of the giant computer I assume assembles the fixture list, the Latics opened the year against all three recently promoted sides consecutively. They drew Norwich and Swansea before beating QPR. Then, they lost nine straight (eight in the league and a Carling Cup tie with Crystal Palace) and plummeted to the bottom of the table. Then, a wild 3-3 draw with fellow cellar dwelling Blackburn Rovers (during which Blackburn equalized deep in stoppage time after their goalkeeper drew a penalty while pushing forward.) Last weekend, they finally won again, for the first time since August, beating Sunderland 2-1 at the Stadium of Light. So yes, that form, in short: draw - draw - win - nine losses in a row - draw - win. Only Blackburn sits behind them in the table, because Blackburn have only won once..... and, I just made myself sad. road last year when the opponent didn't force them to. Matches without a team wearing red shouldn't count. calls Wigan the "Lactics." Photo: Daily Mail. Wigan has only been a top flight side since 2005, meaning they have only faced Arsenal a total of 16 times across all competitions. Arsenal have won 12 of those meetings and have only dropped points against the Latics at the DW (formerly JJB) Stadium. One of those set-backs came in the 2006 League Cup semi-final, which Wigan eventually won on away goals at the death. Wigan's other win against Arsenal came in April of 2010, when Lukasz Fabianski (on his birthday) handed them some goals in the closing ten minutes. Last year, Wigan stole a point from Arsenal in this fixture, meaning Arsenal has now gone two years without a win at the DW Stadium. For Arsenal, it was a Wednesday fixture following a 3-1 win over Chelsea two days earlier, and as such, Arsene Wenger rotated the squad, to the tune of eight changes to the side. Wigan scored first from a penalty before Andrei Arshavin and Nicklas Bendtner scored to put Arsenal up 2-1 at the half. Wigan were reduced to ten men when Charles N'Zogbia headbutted Jack Wilshere (who did not actually start this match, but came on after Abou Diaby left hurt. Isn't that surprising?) 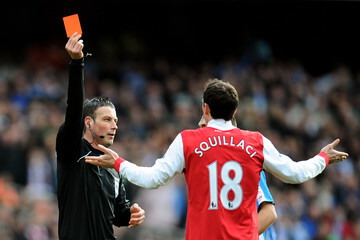 but two minutes later, a Sebastien Squillaci own goal brought Wigan level. For two straight seasons, Arsenal has been content at Wigan to sit back on leads in the second half and for two straight seasons, Arsenal has dropped points from winning positions. There was still a lot of snow on the ground on the street outside of the Blind Pig that day, after the snowstorm that hit New York the day after Christmas; if you know me well at all, you'll know for sure that after dropping these points that day, I was outside kicking the snow, in tremendous frustration. Arsenal are, on the other hand, 9-0 all-time against Wigan at home (even though they lost on away goals in the 2006 Carling Cup, they won the fixture itself 2-1.) Robin van Persie had a hat trick in Arsenal's comfortable 3-0 win over Wigan in January in the most recent meeting between the sides. Arsenal also beat Wigan 2-0 in the Carling Cup at the Emirates last season, in the same round from which they were just bounced by Manchester City this year. You know, this was probably for the best. Photo: Zimbio. The referee is Tyne & Wear-based Mark Clattenburg. I've gone on the record plenty of times to say that Clattenburg is the referee I like the most / despise the least, largely on the coincidence that Arsenal have won some pretty big games with him in the middle lately, without much negativity surrounding said games. Last season, Clattenburg was in charge for Arsenal's 3-0 win at Manchester City (when Dedryck Boyata was sent off after five minutes,) their 4-2 win at Aston Villa, the 3-1 win over Chelsea at the Emirates, and the 2-1 win over Huddersfield Town in the FA Cup (where, while Squillaci was sent off, Arsenal benefited from a late penalty to win.) This year, he's worked one Arsenal game, the 3-0 win against Bolton which stands along with the West Brom win as one of the more comfortable wins of the season. Bolton ended that match on ten men. He has taken charge of one Wigan match this year, a 2-0 loss at Aston Villa. Other notable matches he has refereed this season include City's 6-1 win at Old Trafford, a Euro qualifier which saw Sweden beat Finland 2-1 (that's gotta be like a local derby, right? ), and a Champions League group stage match between Real Madrid and Ajax that ended 3-0 to the Spanish side at the Bernabeu. last year, which ended in a 1-1 draw. Photo: Sky Sports. 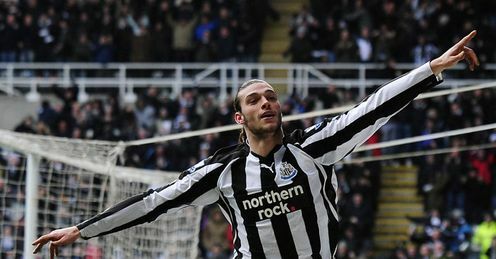 The weekend opens with fourth place Newcastle hosting fifth place Chelsea at Mike Ashley's Sports Direct Stadium Arena Land @ St. James's Park dot com. The Toon took a point out of Old Trafford last weekend. This match may well and truly decide how "for real" Newcastle may be this season. As for Manchester United, they are five points back of City for the top of the table; they travel to eighth place Aston Villa in Saturday's late game. Villa is seven points back of Arsenal for seventh place. In addition to Wigan v. Arsenal, there are four other matches taking place in the 10:00 a.m. Eastern time slot. Last place Blackburn Rovers welcome 13th place Swansea City to the Steve Kean Out Stadium Ewood Park, the Eastlands Millionaires Club hosts Norwich City, Queens Park Rangers host West Bromwich Albion in a battle of teams with three words in their name (grasping for straws here,) and Spurs welcome 18th place Bolton Wanderers to the Lane. Spurs are unbeaten in ten in the league and now sit in third, though their most difficult matches in that time span were the draw at Newcastle and wins over Arsenal and Liverpool at home. Granted, they did batter Liverpool and you can't fault a team for winning the games you're supposed to win. But, I can try, because it's Spurs, and they'd do the same to us. Sunday's extravagant fixtures feature Everton hosting Stoke and Wolves hosting Steve Bruce-less Sunderland. Enthralling! Then, on Monday, Fulham hosts Liverpool at Craven Cottage. Arsenal can climb to fifth after this weekend if things work in their favor (which would involve winning, Liverpool dropping points, and Chelsea losing at Newcastle.) Plausible, no?